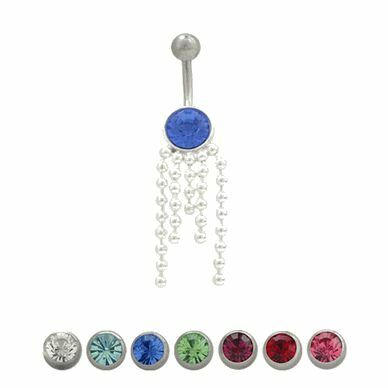 This glamorous design belly button ring has a 316L high grade surgical steel shaft with colored stone, and 5 rows of .925 sterling silver beads hanging down from the jewel in your choice of clear, light blue, dark blue, green, purple, red, or pink. This belly ring is 14 gauge and the length is 10mm-3/8 of an inch. The externally threaded top bead size is 5mm and the bottom is 8mm. Entire piece is nickel free.